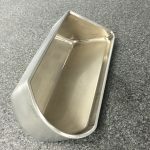 Deep Drawn Nickel Alloys – Quick Draw Machining, Inc.
Inconel is a nickel-chromium alloy able to withstand high temperatures and resistant to corrosion by chloride ions and pure water making it a very attractive metal in the aircraft and aerospace industries. Inconel alloys differ in properties like malleability, elasticity and resistance to corrosion, temperature, and different substances. Inconel alloys are able to withstand large amounts of mechanical stress without losing any of its structural reliability. Materials such as aluminum and steel usually deform when put under extreme heat. Inconel alloys are typically used for components which are exposed to extreme environments which experience large amounts of pressure and heat. Inconel’s high temperature strength is developed by solid solution strengthening or precipitation hardening, depending on the alloy. Due to a high melting point Inconel is not an ideal candidate for casting as it will degrade the tool faster than other metals. With the deep draw process and using D2 tool steel mass amounts of production can be run off of the same tool before maintenance or redesign will occur. Inconel is a more challenging metal to form but done in the proper reduction can yield a flawless end product. Due to rapid work hardening it is important to take aggressive but slow cuts on final trims to minimize the number of passes required. Using a heat source, such as laser cutting, to trim will cause material to harden. In aircrafts the manifold vacuum is an effect of a piston’s movement on the induction stroke and the choked flow through a throttle in the intake manifold of an engine. It is a measure of restriction of airflow through the engine, or the unused power capacity of the engine.